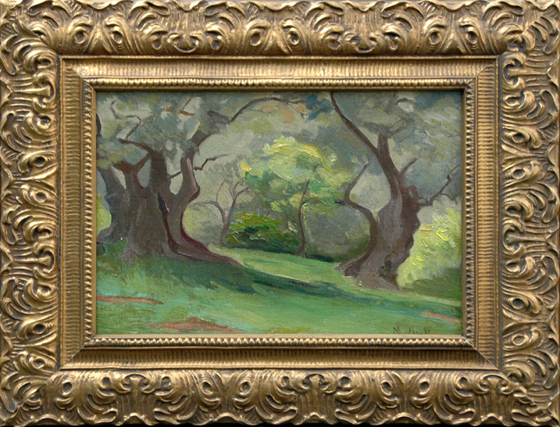 “Southern Scene”, oil on canvasboard, 9.5″ x 12.5″, signed lower right. This painting is in excellent condition in a nice original gold frame also in excellent condition. Born in Summit, Mississippi, Hull was a revered and influential figure in Mississippi and generally in the South. In 1975, the Governor of Mississippi proclaimed “Marie Hull Day” because of her impact on art in that state. She studied at the Pennsylvania Academy of the Fine Arts with Daniel Garber and Hugh Breckenridge. She returned to Mississippi and taught at Hillman College. She also traveled around the United States and studied at the Colorado Springs Fine Art Center with Robert Reid and John F. Carlson. In 1922, she enrolled at the Art Students League Frank Vincent Dumond and Robert Vonnoh. She traveled in Europe studying under George Elmer Browne in France and Spain, and in Morocco, Canada, and Mexico. She was inspired by exotic locales, rich coloration, and varied architectural forms. Hull was experimental and interested in exploring materials, techniques and abstraction. She exhibited at Art Institute, Chicago; American Watercolor Society; Butler Art Institute, Youngstown, Ohio; Ringling Museum, Sarasota, Florida; Southeastern Annuals, Atlanta; Delta Annuals, Memphis; All-American National Shows, New York City; Autumn Salon, Paris; New York World’s Fair (1939) and the San Francisco Golden Gate Exposition (1939). A major exhibition of her work was held at the Mississippi Museum of Art in 2000.